Chris Nighman is making the old new again with the help of a high-tech scanner in the Wilfrid Laurier University Archives. 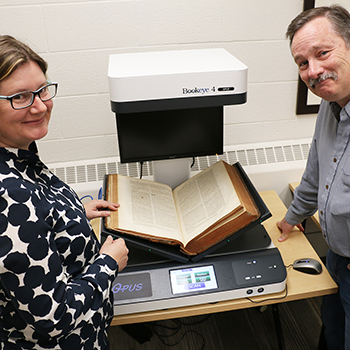 An associate professor in Laurier’s Department of History and coordinator of the university’s Medieval and Medievalism Studies program, Nighman and a student assistant are using a recently acquired overhead scanner to create a high-resolution digital version of a rare 18th-century text that is part of the Laurier Library’s rare book collection. The final product will be unique in the world. The title of the book that contains the text Nighman is digitizing might scare off the average reader, but certainly not a seasoned professor of history or an eager student. "Sancti Patris Nostri Joannis Chrysostomi… Opera Omnia" includes a Latin translation of John Chrysostom’s 88 homilies on the Gospel of John by Bernard de Montfaucon, published in Paris, France, in 1728. "Bernard de Montfaucon was a Dominican friar who devoted his life to his work," says Nighman. "He is considered the master of studies pertaining to the early church fathers in the first half of the 18th century for his work as an editor and translator." The Laurier Archives, housed in the lower level of Laurier's Waterloo campus library, is one of the few archives in North America to possess of a copy of Montfaucon's 18th-century book. It is the eighth volume in a 13-volume set housed in the archives, all published in France during the early 1700s. Creating digital versions of rare books like this and publishing them online will be made easier thanks to the archives' new scanner, says Julia Hendry, head of the Laurier Archives. "Until now, we haven’t been able to digitize our fragile or large bound books and documents because pressing books onto flatbed scanners can ruin the bindings," says Hendry. "This new equipment will allow us to make very high-quality digital images of things like printed books, scrapbooks and bound manuscripts without fear of damaging the book." The works Montfaucon translated into Latin as part of "Sancti Patris Nostri Joannis Chrysostomi… Opera Omnia" are a series of homilies, sermons and other texts written in Greek by Chrysostom, a saint in the Greek church who lived from the year 349 to 407 and served as the archbishop of Constantinople. Theologians, clergy members and philosophers would have been the original readers of Chrysostom's works, which are renowned for their eloquence. Chrysostom's homilies on John had been translated for the first time into Latin during the 12th century. They were later retranslated by a humanist during the Renaissance in the 15th century and retranslated again by Montfaucon during the Enlightenment. "Our digital project seeks to provide all three translations side by side," says Nighman. "Montfaucon's book has two columns. We're creating four columns with the 12th-, 15th- and 18th-century translations and Montfaucon’s edition of the original Greek text. Providing three different versions of the Latin translations against the Greek original is unique. I don't think there's anything else like this." Digital versions of the 12th- and 15th-century texts are currently being transcribed and they will be paired with a transcription of Montfaucon’s translation and the Greek text Nighman is scanning from Montfaucon's book in the Laurier Archives. While another digital version of Montfaucon's book does exist, its resolution is low, making parts hard to read and unsuitable for the project Nighman is undertaking. The new scanner at the Laurier Archives, a Bookeye 4 Scanner v2 by Image Access, is what is known as a planetary scanner, which suspends a scanner above a book or document. It is considered a crucial piece of equipment for modern research libraries with a significant archive or rare book collection because it allows for the digitization of images and text with minimal impact on delicate source materials. Nighman was awarded an internal grant of $14,000 from Laurier that helped pay for the $35,000 scanner, with the library paying the remainder of the cost. In addition, Nighman was awarded a $38,000 Insight Development Grant over two years from Canada's Social Sciences and Humanities Research Council to fund his digitization project, with 90 per cent of those funds dedicated to student salaries. "When complete, this project will provide a scholarly resource for others to use, as well as for my own use," says Nighman. "And in the meantime, it's giving grad students and undergrads employment, experience and experiential learning opportunities." Nighman's research assistant for the scanning project is Taylor Tryburski, who graduated from Laurier last October with a combined Honours BA in Ancient Mediterranean Studies and Medieval Studies, with high distinction and the Faculty of Arts gold medal. The work of scanning the book and piecing it together digitally will be complete by the end of the summer. "The field of digital humanities is a major scholarly endeavour now, something that brings scholars and librarians together in ventures such as this," says Nighman. "The big impulse here is the 'open access' movement, making research materials and tools available for free to anyone who has a computer and Internet access." Once Nighman's scanning project is complete, the archives will ramp up other digitization efforts and patrons utilizing the archives' special collections will be provided use of the scanner if required. "We're very excited about working to digitize items and make them available online, both for the university and scholarly community," says Hendry. "We have this wonderful collection of really rare materials available and not everybody knows that." The Laurier Archives is open to the public Monday to Friday from 10 a.m. to 4:30 p.m.